A dog bite can happen to anyone at any age. Statistics show, however, that infants and toddlers under age 3 are bitten more often than many other age groups, and that they can face more serious physical and psychological consequences as a result, according to a recent study performed at Children’s Hospital Los Angeles. 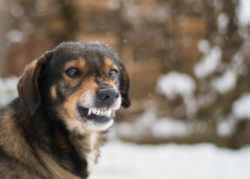 The study, published in the journal Injury Prevention, found that about 5 million people in the U.S. are bitten by dogs each year. About half of those bitten are children. Researchers analyzed 7,900 dog bite cases listed in the National Trauma Data Bank between 2007 and 2014. All the cases involved patients who were 17 years or younger when the bite occurred. The researchers found that 30 percent of the children bitten were under the age of 3 years at the time of the bite. Nearly 84 percent of the dog bites occurred while the child was at home. While boys were bitten more often overall, girls were bitten more often during the infant and toddler years. Just over half of the bite injuries to babies and toddlers were bites to the face. Babies and toddlers are still learning about the world around them, and this includes learning how to interact with dogs and other animals. Parents and caregivers have an important role to play in teaching safety and in protecting children from dogs who show signs of stress or aggression that may lead to a bite. For older children, researchers suggested, education on how to spot signs of stress or aggression in dogs might help reduce the risk of dog bites. Children ages 6-12 can learn to “read” when a dog needs to be left alone and act accordingly.